Harnessing the power of mobile technology to improve knowledge, attitudes and practices towards nutrition for millions of adolescent girls. Adolescent girls face a widespread and invisible threat. One that puts their ability to learn, grow and thrive at risk. And it’s one of the greatest prevailing symptoms of gender inequality around the world: Malnutrition. In June 2018, Girl Effect and Nutrition International, the global nutrition organisation, announced a two-year partnership to tackle malnutrition in teenage girls living in Indonesia. Together, our aim is to put better nutrition on the menu for adolescent girls around the world. We’re starting in Indonesia which has some of the most worrying global statistics on nutrition. The partnership will improve millions of Indonesian girls’ knowledge of nutrition and empower them to lead healthier, happier lives. 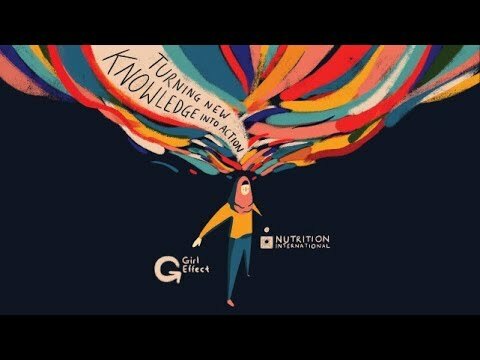 Girl Effect and Nutrition International: Turning new knowledge into action. The partnership brings together Nutrition Leverage and Influence for Transformation (NLIFT), a Nutrition International initiative which integrates nutrition interventions into existing development programmes, and Springster, Girl Effect’s global mobile community for girls. Engaging, fun and interactive nutrition content will be highlighted and discussed on Springster through factual articles, stories from girls, quizzes, games and expert Q&As. But our partnership isn’t limited to Indonesia. We’re currently exploring ways to introduce nutrition counselling into schools for adolescent girls in Nigeria. And to learn more about girls’ experiences and thoughts around nutrition and food security, Nutrition International has partnered with TEGA, Girl Effect’s Technology Enabled Girl Ambassadors.